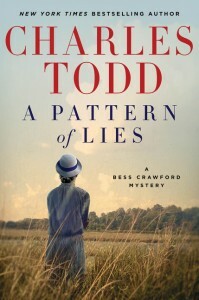 Earlier this summer, thanks to TLC Book Tours, I had the pleasure of catching up on the fictional adventures of World War I nurse and amateur sleuth Bess Crawford. I reviewed An Unwilling Accomplice, the sixth book featuring Bess, in July, and today it’s my turn to review book #7, A Pattern of Lies. Stranded in Canterbury over a short leave in 1918, Bess runs into an old friend: Mark Ashton, a soldier she nursed in France earlier in the war. As a guest at the Ashtons’ family home, Bess finds herself drawn into the drama surrounding an explosion at a nearby gunpowder mill run by Mark’s father, Philip. The explosion occurred two years before, but in light of supposedly damning new evidence, Philip Ashton is arrested while Bess is staying with the family. Mark asks Bess to help clear his father’s name by searching for a Sergeant Rollins, one of the only eyewitnesses to the explosion. As Bess heads back to France and crisscrosses the English Channel on subsequent assignments, she searches for Rollins and other key players in the drama, but they prove elusive. Meanwhile, the Ashton family faces social isolation and vandalism – and someone may want to silence both Rollins and Bess. I also enjoyed Bess’ return to her nursing work on the front lines in this book, especially after An Unwilling Accomplice focused mostly on a remote cluster of villages in Shropshire. A Pattern of Lies takes place in the autumn of 1918, and everyone Bess meets – fellow nurses, soldiers, family members – is hoping the war is almost over. I particularly relished a glimpse of Sergeant Lassiter, the cheeky Australian who has popped up in previous books. This post is part of the TLC Book Tour for A Pattern of Lies. I received a free advance copy of this book for review; all opinions are, of course, my own. I adore this series, but am moving through it slowly to make it last as long as possible! Thanks for letting me know about the newest installment, and I’m so pleased Sgt. Lassiter makes an appearance! There IS so much more to England than London – you are so very right! I’m glad you enjoyed the latest Bess adventure. Thanks for being a part of the tour!